Imagine acquiring the power to produce your own food. Boom! Veggies over here. Bam! Herbs over there. Wham! Strawberries! Zap! Fresh-laid eggs, coming right up! Most city-livers are so distant from the sources of what they eat that this seems like magic. 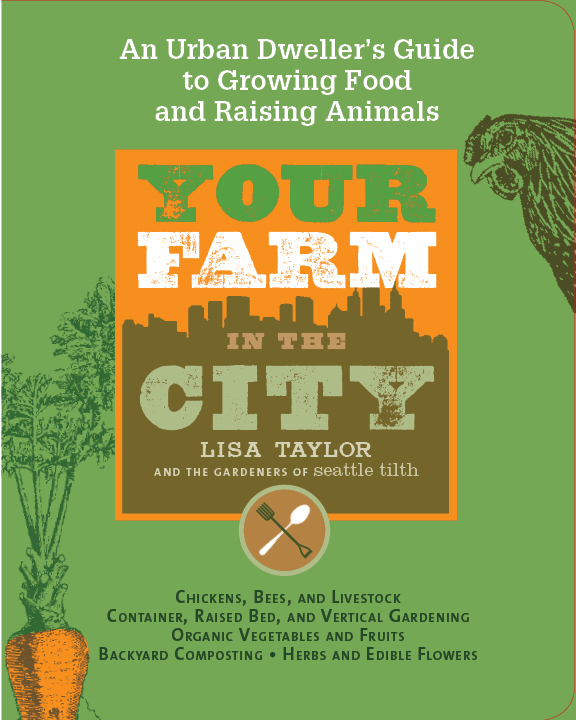 But in her new book Your Farm in the City, Lisa Taylor of Seattle Tilth explains that starting an urban farm is no mystery, but rather something deeply satisfying that we can all do. Meet Lisa, learn about the book and get a signed copy this Thursday, March 31st at 7 PM at the offices of Tilth in the Good Shepherd Center. What inspired you to write Your Farm in the City? I was interested in creating a resource for growing fruits and vegetables for beginning gardeners. Each week (each day?) we have folks come into our office all excited about growing some food at home but they have no idea how to start or what to do. They ask us if there is a book that covers everything they need to know and frankly we have been at a loss to recommend one. Most of the gardening books we like are for more advanced growers and are often a bit complicated and prescriptive. As I was writing “Your Farm in the City” I thought about these folks and tried to write something that was uncomplicated and comprehensive without being intimidating. I wanted to be inspirational. How do you think our neighbors in Wallingford would most benefit from the book? What sorts of urban gardening are we already doing? I think because Seattle Tilth has been in Wallingford for 33 years that there are already many people who are raising food and small livestock in the neighborhood. Some of the first city chickens that I knew about were housed in a modest coop on Thackaray way back in the late 1990’s. However there are plenty of new folks moving into the neighborhood with young families and I think this book will be a great benefit to them. Maybe the most practical thing that Wally folks will get from the book is the idea about creative small space gardening techniques — using containers, incorporating edibles into the landscape and vertical growing. What are some good projects for beginners? If folks are just starting out, my advice is to start small. Give yourself a budget and stick to it (it is really easy to go over board and spend way too much money on gardening). Plant a small garden with a few vegetables that you like to eat and some herbs. Start a compost pile or worm bin. Eat what you grow. Learn as much as you can. As for veggies that are easy — I like peas, beans, salad greens, and members of the cabbage tribe (kale, collards, arugula, etc). If you are a beginner, go easy on the tropicals like tomatoes, peppers and eggplants — they grow ok here but it more difficult to get fruit to ripen. 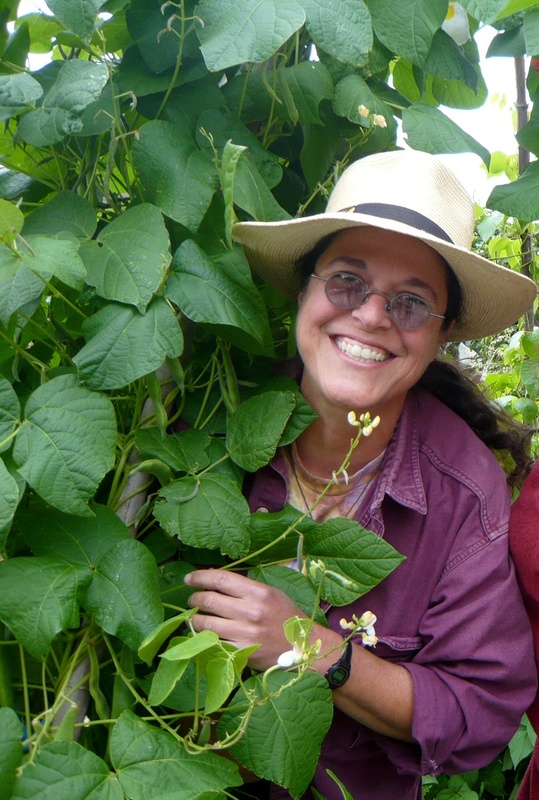 Take a class or two, find other food gardeners in your neighborhood and talk with them. Read some good books. Just try planting something, pay close attention and learn as you grow — keep a garden journal to record your progress and to track your learning. What is your personal urban garden like? I grow food year round at my home. In fact, my yard doesn’t really feel like a typical yard because there are gardens all around it. I have food growing in containers, in old wagons, in framed raised beds, in mounded raised beds, in burlap sacks and in old compost bins (potatoes). Most importantly, I eat from my yard all year (sometimes the food comes out of the freezer or pantry) — this has been my main goal as an organic gardener. What’s the urban gardening movement all about? Urban farming has been around since the advent of cities — nothing new here — there are number of reasons folks are motivated to grow some of their own food now. Good exercise in fresh air and natural light without the cost of a gym membership. Homegrown veg surpass store-bought in freshness, taste and variety. Reducing our carbon footprint — they say our trips to the store to buy food actually contribute more to global climate change that the transporting and processing of the food (which is considerable)! Great way to get kids connected to nature and to their food — also opens up food choices for picky eaters. Creating community by growing and sharing homegrown food. Oh, the list could go on and on! Grab a copy and get your fingers into the soil. What grows could surprise you!